The health of an individual has to be taken into consideration before determining whether getting started with scuba diving is a good idea. Asthma and scuba diving is often a complicated topic. While asthmatics may be at a higher risk of injury or accident while scuba diving, they aren’t completely incapable of diving. People who struggle with asthma but are in good shape can learn to dive safely. Nowadays, asthma is not considered to be an absolute scuba diving contraindication. However, before someone who has asthma puts on a dry suit, he/she should be evaluated by a physician to determine his/her fitness to dive. Doctors consider a couple of things during the evaluation, including what triggers asthma, history of attacks, severity, and type of asthma. If you have asthma and you are finding it difficult to determine whether you should invest in a scuba gear package, this article is for you. We will be answering all questions related to asthma and scuba diving. Before we take a deeper look at asthma and scuba diving, it is essential that you have a better understanding of what asthma is. Asthma is a health complication that causes the airways to constrict in response to various stimuli. People who have asthma may experience asthmatic attacks (or episodes) when exposed to cold or allergens. Asthma attacks are often a response to either exercise or when someone with asthma is placed under stress. Asthma is a common health issue. A study conducted by the CDC confirms that approximately 8% of the adults living in the United States have been diagnosed with the health issue at some point in their lives. Some people develop this health complication during their childhood but later grow out of it. Some people develop asthma later in their adult life. What Makes Scuba Diving with Asthma Dangerous? Scuba diving dangers and risks can affect anyone. If you have asthma, the risks may be higher. In this section, we will help you figure out why this is the case. During an asthma episode/attack, the airways contract. This results in the air not having the ability to move in and out of the lungs efficiently. This friction increases the effort required during inhaling and exhaling. The air in the scuba tank is generally compressed by the water pressure. When compared to the air on the surface, compressed air is denser. This means that it already features a higher breathing resistance. The deeper the scuba diver is, the thicker/denser the air that he/she breathes is, and hence, the higher the breathing resistance. The underwater breathing resistance combined with the resistance caused by the asthma attack increases the chances of the scuba diver not having the ability to get enough air into his/her lungs. As the scuba diver ascends, the air in his/her lungs will start expanding in response to the decreasing water pressure. For a non-asthmatic diver, this is not a problem since the expanding air will be able to escape from the lungs easily. However, for someone who is dealing with an asthma attack, releasing air from his/her lungs at the normal rate may be impossible considering that his/her airways are already contracted. The expanding air may end up being trapped in the scuba diver’s lungs. This could lead to decompression illness, which often has severe and in some instances, fatal effects. When compared to normal exercise, scuba diving with asthma is more dangerous. During underwater navigation, it is impossible for the scuba diver to cease exercise immediately or use his/her rescue inhaler. Is Asthma Considered an Absolute Contraindication for Scuba Diving? Some asthmatic people may be allowed to scuba dive. The decision largely depends on a person’s medical history and the type of asthma. If you do have asthma, before you wear your best dive hood, you should talk to a diving doctor, study the risks involved when diving with asthma and also undergo lung health tests. As mentioned earlier on, after visiting your doctor, he/she will consider things like the asthma attack frequency, your medication, asthma history, and type of asthma before clearing you to wear your best dive boots and explore the underwaters. If your asthma is generally triggered by stress, cold, or exercise, then it could be an absolute contraindication to diving. This is simply because even if you have already invested in the best dive safety gear, you are likely to encounter these triggers. On the other hand, if your asthma is generally triggered by allergens, for example, cat hair or pollen, the condition may not be a diving contraindication. It is highly unlikely that you will encounter these triggers when you are scuba diving with asthma. If you do take medication to keep your asthma under control, you may not be prohibited from scuba diving. However, before scuba diving with asthma can be allowed, your asthma has to be under control. Various medications used by asthmatic people are already approved for diving. Your doctor should consider the medication you use and how effective it is in keeping asthma attacks away. 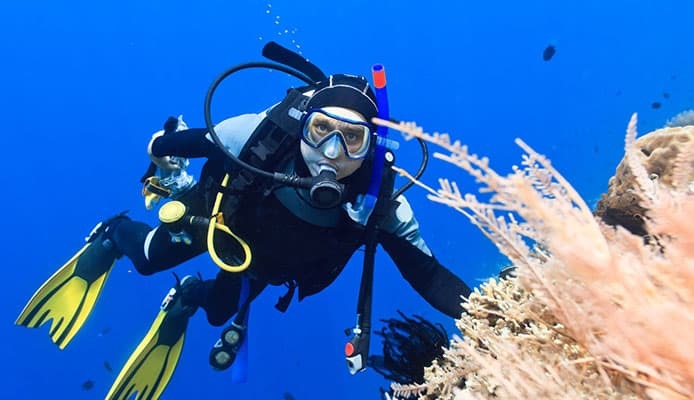 If the medication is effective enough, your doctor may allow scuba diving with asthma. When Discussing Asthma and Scuba Diving with Your Doctor, Why Are Physical Tests Important? Physical tests are crucial when trying to determine whether scuba diving with asthma is a good idea. When discussing asthma and scuba diving, the lung condition is something that cannot be ignored. Physical tests help figure out whether an asthmatic scuba diver is fit enough to dive. People who have had a few recent asthma episodes or none at all may still lack the needed diving fitness if their lungs are in poor condition or weak. It is a good idea to not trust doctors who provide an answer without conducting a physical evaluation. There is still some debate on whether this test is ideal for testing diving fitness. Some doctors have reported that the test resulted in false positives. The test involves aspirating saline water into the lungs and then testing variables to see how the lungs will react. This is one of the most important tests before an asthmatic person decides to embark on night diving. This test requires the individual to breathe into a machine. The machine will use the information it obtains from the way the asthmatic individual breathes to evaluate how his/her lungs are functioning. In some instances, the person being evaluated may be required to breathe in completely and then breath out as hard and for as long as he/she can. This test can use either a peak flow meter or a sophisticated spirometer. When compared to the peak flow meter, the spirometer offers more reliable results. Before an asthmatic person can prepare for a dive holiday, it is often essential to evaluate how effective his/her asthma medication is. This test evaluates the lungs after the asthmatic individual has taken his or her medications. If the meds are effective in controlling asthma, the individual may be allowed to scuba dive. The peak flow test and the spirometry are used to test the asthmatic individual after an exercise. The results obtained from this test help the doctor to figure out whether an asthma attack can be induced by an exercise or not. If the results obtained from the tests mentioned above look promising, an asthmatic person may be cleared to go scuba diving with the sharks. If an asthmatic person gets cleared to go scuba diving, he or she may need to use the rescue inhaler about half an hour before diving, as a preventative measure. 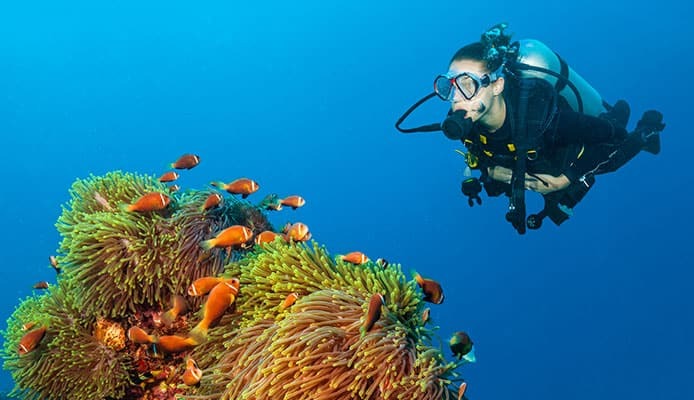 Although asthma and scuba diving research indicates that people who have asthma have a higher risk of injury or an accident, doctors do agree that the condition is not an absolute scuba diving contraindication. However, the decision on whether scuba diving with asthma is a good idea should be made by the affected individual and a doctor after careful testing and consideration of the different factors which may affect asthma and scuba diving.